Optical Fibre Interface for Blackmagic Design VIdeohub 72 or 288. 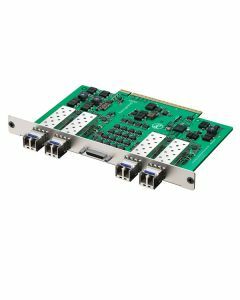 Includes 4 Optical Fibre Inputs and 4 Optical Fibre Outputs plus a Breakout Cable to 4 x RS-422 deck control connectors, re-clocking and SD, HD and 3 Gb/s. 1310nm laser drivers and recievers up to 25km at 3 Gb/s.